For other uses, see Moselle (disambiguation). The Moselle (French: la Moselle IPA: [mɔzɛl]; German: Mosel IPA: [ˈmoːzəl]; Luxembourgish: Musel) is a river flowing through France, Luxembourg, and Germany. It is a left tributary of the Rhine, which it joins at Koblenz. A small part of Belgium is also drained by the Moselle through the Sauer and the Our. The Moselle "twists and turns its way between Trier and Koblenz along one of Germany's most beautiful river valleys." It flows through a region that has been influenced by mankind since it was first cultivated by the Romans. Today, its hillsides are covered by terraced vineyards where "some of the best Rieslings grow", and numerous ruined castles dominate the hilltops above wine villages and towns that line the riverbanks. 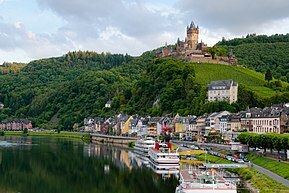 Traben-Trarbach with its art nouveau architecture and Bernkastel-Kues with its traditional market square are two of the many popular tourist attractions on the Moselle river. The name Moselle is derived from the Celtic name form, Mosela, via the Latin Mosella, a diminutive form of Mosa, the Latin description of the Meuse, which used to flow parallel to the Moselle. So the Mosella was the "Little Meuse". The Moselle is first recorded by Tacitus in Book 13 of his Annals and in Book 4 of his Histories. The Roman poet Ausonius made it a literary theme as early as the 4th century. In his poem dated 371, called Mosella, which was published in 483 hexameters, this poet of the Late Antiquity and teacher at the Trier Imperial Court (Kaiserhof) described a journey from Bingen over the Hunsrück hills to the Moselle and then following its course to Trier on the road named after him, the Via Ausonius. Ausonius describes flourishing and rich landscapes along the river and in the valley of the Moselle, thanks to the policies of their Roman rulers. The river subsequently gave its name to two French republican départements: Moselle and Meurthe-et-Moselle. The source of the Moselle is at 715 m (2,346 ft) above sea level on the Col de Bussang on the western slopes of the Ballon d'Alsace in the Vosges. After 544 km (338 mi) it discharges into the Rhine at the Deutsches Eck in Koblenz at a height of 59 m (194 ft) above NHN sea level. The length of the river in France is 314 km (195 mi), for 39 km (24 mi) it forms the border between Germany and Luxembourg, and 208 km (129 mi) is solely within Germany. The Moselle flows through the Lorraine region, west of the Vosges. Further downstream, in Germany, the Moselle valley forms the division between the Eifel and Hunsrück mountain regions. The average flow rate of the Moselle at its mouth is 328 m3/s (11,600 cu ft/s), making it the second largest tributary of the Rhine by volume after the Aare (560 m3/s, 20,000 cu ft/s) and bigger than the Main and Neckar. The section of the Moselle from the France–Germany–Luxembourg tripoint near Schengen to its confluence with the Saar near Konz shortly before Trier is in Germany known (geographically incorrectly) as the Upper Moselle. The section from Trier to Pünderich is the Middle Moselle, the section between Pünderich and its mouth in Koblenz as the Lower Moselle or Terraced Moselle (Terrassenmosel). Characteristic of the Middle and Lower Moselle are its wide meanders cut deeply into the highlands of the Rhenish Massif, the most striking of which is the Cochemer Krampen between Bremm and Cochem. Also typical are its vineyard terraces. From the tripoint the Moselle marks the entire Saarland–Luxembourg border. The catchment area of the Moselle is 28,286 km2 (10,921 sq mi) in area. 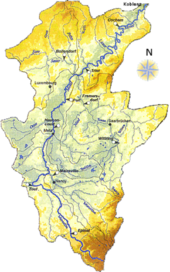 The French part covers 15,360 km2 (5,930 sq mi), about 54 percent of the entire catchment. The German state of Rhineland-Palatinate has 6,980 km2 (2,690 sq mi), the Saarland 2,569 km2 (992 sq mi), Luxembourg 2,521 km2 (973 sq mi), Wallonia in Belgium 767 km2 (296 sq mi) and North Rhine-Westphalia, 88 km2 (34 sq mi). The three largest tributaries of the Moselle are, in order, the Meurthe, the Saar and the Sauer. The Meurthe was the old upper course of the Moselle, until the latter captured the former upper reaches of the Meuse and took it over. However, the Meuse only delivered a little more water than the Meurthe at its confluence. The Saar is the biggest of all the tributaries (78.2 m3/s, 2,760 cu ft/s) as well as the longest (246 km, 153 mi). The Sauer is the largest left-hand tributary and drains the region on either side of the German-Luxembourg border. The largest tributary relative to the Moselle at its confluence is the Moselotte, which is about 40% greater by volumetric flow and thus represents the main branch of the Moselle system. At its mouth, the Moselle delivers 328 m3/s (11,600 cu ft/s) of water into the Rhine after flowing for 544 km (338 mi). Madon, Terrouin, Esch, Rupt de Mad, Orne, Fensch, Gander, Syre, Sauer, Kyll, Salm, Lieser, Alf, Endert, Brohlbach, Elz. Moselotte, Vologne, Meurthe, Seille, Saar, Olewiger Bach, Avelsbach, Ruwer, Feller Bach, Dhron, Ahringsbach, Kautenbach, Lützbach, Flaumbach, Altlayer Bach, Baybach, Ehrbach. From Trier downstream the Moselle separates the two Central Upland ranges of the Eifel (to the northwest) and the Hunsrück (to the southeast). The Vosges, the present source region of the Moselle, were formed about 50 million years ago. In the Miocene and Pliocene epochs the ancient Moselle (Urmosel) was already a tributary of the ancient Rhine (Ur-Rhein). When, in the Quaternary period, the Rhenish Massif slowly rose, the meanders of the Moselle were formed between the Trier Valley and the Neuwied Basin. The highest navigable water level (HSW) is 6.95 m (22 ft 10 in) and normal level (NSt) is 2.00 m (6 ft 7 in) at the Trier Gauge (Pegel Trier). The Moselle was known to the Romans by the name of Flumen Musalla (in the Tabula Peutingeriana), and the river was romanticised by the poet Ausonius around 371. From 1815, the Moselle formed the border between the Grand Duchy of Luxembourg and Prussia (German Empire in 1871). In the act of 10 April 1952 ratifying the treaty instituted by the ECSC, Article 2 charged the French Government "to initiate, before the establishment of the Common Market, negotiations with the governments concerned in order to achieve a rapid implementation of the canalisation of the Moselle between Thionville and Koblenz. The River was canalised between Metz and Thionville, via a canal opened in 1964 by the Grand Duchess, Charlotte of Luxembourg, the Federal Chancellor of Germany, Konrad Adenauer and their host, Charles de Gaulle, President of France. It is on the Moselle, at the site of the France–Germany–Luxembourg tripoint, that the Schengen Agreement was signed in 1992, establishing the free movement of goods and people in the European Community. The Moselle valley between Metz and Thionville is an industrial area, with coal mining and steel manufacturers. The Moselle valley is famous for its scenery and wine. Most well-known is the German Mosel wine region, while the Luxembourg winegrowing region is called Moselle Luxembourgeoise and the French region is called AOC Moselle. Most notable among the wines produced here are Riesling, Elbling, Müller-Thurgau, Kerner, and Auxerrois. The German part of the Moselle is a particularly popular tourist destination. After the Second World War, France pressed to be able to ply the Moselle with larger ships in order to be able to link the industrial regions of Lorraine. When, in 1955, the population on the Saar voted to belong to West Germany, France demanded as "compensation" an upgrade of the Moselle. On 27 October 1956 they concluded the Moselle Treaty with Germany and Luxembourg for a canalisation of the Moselle and conceded to Germany in return the extension of the Grand Canal d'Alsace on the Upper Rhine instead of an extension of the canal via Breisach. In 1958 work began and by 26 May 1964 the Moselle could be officially opened from Metz to Koblenz as a major waterway for shipping with 14 locks. France extended it by 1979 as far as Neuves-Maisons. With that, 394 km (245 mi) of the Moselle have been upgraded with a total of 28 locks. In the years 1992 to 1999 the navigable channel was deepened from 2.7 m (8 ft 10 in) to 3.0 m (9 ft 10 in), which enables 1,500-tonne freighters to use the river, a 20% increase in capacity. The channel has a width of 40 m (130 ft), more on the bends. The International Moselle Commission (IMK), founded in 1962 with its head office in Trier, is responsible for navigation. The Moselle Shipping Police Act which it has produced is valid in all three participant states from Metz to Koblenz. In 1921 the Moselle (Mo) became a Reich waterway, today it is a federal waterway (Bundeswasserstraße) from Apach at the tripoint to its mouth on the Rhine at kilometre point 592.29 in Koblenz. The waterway is 242 km (150 mi) long and managed by the Trier and Koblenz Water and Shipping Offices (Wasser- und Schifffahrtsämtern Trier und Koblenz). It is categorized as a European waterway of Class Vb. Its kilometrage begins at its mouth at kilometre point 0 and runs upstream. Since 1816 it has formed a 36 km (22 mi) long condominium from Apach, a common Germany–Luxembourg sovereign area with a division of responsibilities set out in a 1976 agreement. The International Moselle Company, initially set up in 1957 to finance the construction of the river's upgrade, manages the shipping charges and the operation and maintenance of the waterway which they are used to fund. Today the Moselle is navigable for large cargo ships up to 110 metres (360 ft) long from the Rhine in Koblenz up to Neuves-Maisons, south of Nancy. For smaller ships it is connected to other parts of France through the Canal de l'Est and the Canal de la Marne au Rhin. There are locks in Koblenz, Lehmen, Müden, Fankel, Sankt Aldegund, Enkirch, Zeltingen, Wintrich, Detzem, Trier, Grevenmacher, Palzem, Apach, Kœnigsmacker, Thionville, Richemont, Talange, Metz, Ars-sur-Moselle, Pagny-sur-Moselle, Blénod-lès-Pont-à-Mousson, Custines, Pompey, Aingeray, Fontenoy-sur-Moselle, Toul, Villey-le-Sec, and Neuves-Maisons. By 1970 more than 10 million tonnes of goods were being transported on the Moselle, the majority on towed barges. Upstream freight mainly comprised fuel and ores; downstream the main goods were steel products, gravel and rocks. There is an inland port at Trier, a transshipment site in Zell (Mosel); and there are other ports in Mertert, Thionville, Metz and Frouard. In addition to freighters there are also pleasure boats for tourists between the very busy wine villages and small towns of the Middle and Lower Moselle. There are also yachting or sports marinas in the following places: Koblenz, Winningen, Brodenbach, Burgen, Löf, Hatzenport, Senheim, Treis, Traben-Trarbach, Kues, Neumagen, Pölich, Schweich, Trier and Konz. The Moselle is linked near Toul via the Canal de la Marne au Rhin with inter alia the Meuse, the Saône and the Rhône. Other canals link the river to the North Sea and even the Mediterranean. 10 in Germany near Trier, Detzem, Wintrich, Zeltingen, Enkirch, St. Aldegund, Fankel, Müden, Lehmen and Koblenz. Detzem is the highest lock – 9 m (30 ft) – and at 29 km (18 mi) the upstream reach is the longest on the river; it is the only lock to be built on a canal of some length excavated outside the river bed. With the exception of Detzem, all the structures at each change in level are laid out side by side; the lock is by one riverbank, the weir in the middle and the hydropower plant on the other bank. Between the lock and weir are a boat slipway and channel and boat lock, while between the weir and the power station is the fish ladder. The structures have been blended into the landscape through their low-level design; this was achieved by the choice of sector gates for the weir, vertically lowering upper gates and mitred lower lock gates. The water levels and hydropower works are controlled by the Fankel Central Control Station (Zentralwarte Fankel) of the RWE Power Company at Fankel. Through the Moselle valley run the Moselle Wine Route and the Moselle Cycleway, which may be cycled from Metz in France via Trier to Koblenz on the River Rhine, a distance of 311 km (193 mi). Between Koblenz and Trier, large sections run on the trackbed of the old Moselle Valley Railway, far from the noise and fumes of motor vehicles. Every year on the Sunday after Pentecost, the 140 km (87 mi) of road between Schweich and Cochem is also car-free as part of Happy Moselle Day. A number of notable castles and ruins adorn the heights above the Moselle valley and many are visible on a boat trip on the Moselle. In 1910, a hiking trail, the Moselle Ridgeway, was established which runs for 185 km (115 mi) on the Eifel side and 262 km (163 mi) on the Hunsrück side. Another unusual trail runs from Ediger-Eller via the Calmont Trail to Bremm through the steepest vineyard in Europe. Before the construction of barrages the Moselle was a popular route for folding kayaks which is why many of the weirs have boat channels. The river is still used today by canoeists, especially during the annual week-long lock closures when no commercial shipping is permitted. In April 2014 the Moselle Trail was opened, a path running for 365 km (227 mi) from Perl on the Upper Moselle to Koblenz. Numerous Moselle Trail "partner trails", the so-called side branches (Seitensprünge) and "dream paths" (Traumpfade) enhance the hiking network in the Moselle Valley. The ADAC's Rallye Deutschland has taken place since 2000 in the vineyards along the Moselle at Veldenz, Dhron, Piesport, Minheim, Kesten, Trittenheim, Fell, Ruwertal and Trier. At Koblenz Locks the Mosellum offers exhibitions about the migration of fish in the Moselle as well as water ecology, navigation and power generation. With the construction of the visitor and information centre the most modern fish ladder along the Moselle was opened. The Moselle winegrowing region lies along the Moselle with a cultivated area of about 10,540 ha (26,000 acres). The largest part, currently just under 9,000 ha (22,000 acres), is on German soil in the states of Rhineland-Palatinate and Saarland; the Luxembourg part has an area of about 1,300 ha (3,200 acres) (see Wine in Luxembourg). Upstream on the Moselle the vineyards extend into France as far as Seille in the region of Côtes de Moselle with an area of 130 ha (320 acres) and to the region around Toul (Côtes de Toul) covering 110 ha (270 acres). The valley sides of the Upper Moselle (also called the Burgundy Moselle, Burgundermosel) with their overwhelmingly muschelkalk soils belong geologically to the so-called Paris Basin, which explains its low proportion of Riesling – only around 10% in 2010 – and the increasing cultivation of Pinot Blanc and Pinot Noir grapes. Around the city of Trier and in the valleys of the Saar and Ruwer with their side valleys, the Riesling is the predominant grape on the shale soils, with over 80% of the crop. One climatic feature of this area is the frequent orientation of often small southwest-southeast facing locations in which the vegetation is exposed to stronger, cooler winds and, especially in the light of recent global warming, often achieve lower degrees of maturity than in the narrow, often deeply incised valley of the Middle and Lower Moselle. With around 6,000 ha (15,000 acres) of vineyard the Middle Moselle is the largest winegrowing area of the Moselle. According to the wine experts and trade, the "greatest" wines of the Moselle, both in quantity and quality, are grown here on land that has been consolidated into large concerns with much vaunted steeply sloped vineyards. In the Lower Moselle Valley, the viticulture is more picturesque: with large numbers of medieval castles, high above little villages, decorated with timber-framed houses, surrounded by steep slopes with small terraces in the narrow, winding valley. Here, cultivating vines is very labour-intensive and costly and it is difficult to make it economical. As a result, it is common for vineyards to fall into ruin here. The wine industry on the German Moselle has been declining for decades. In 2005, statistics showed there were 10,375 ha (25,640 acres) of vineyard; by 2012 this had fallen to just 8,491 ha (20,980 acres). The vineyards that have fallen fallow are mostly those on extremely steep hillsides. There has been a major decline in the number of so-called Nebenerwerbswinzer (vintners for whom it is a secondary occupation), and the small, family farming operations that, until the end of the 1960s formed the majority of wine businesses. Comparative figures by the Chamber of Agriculture for Rhineland-Palatinate for several wine villages on the Lower Moselle show that there were still 797 wine businesses in the early 1960s, but by the early 2000s there were only just under 100. There has been the opposite trend amongst the established traditional wine estates and more recent vintners with a sound education in oenology and business management, who have increased their business through the reclamation of once renowned, but long forgotten sites. The end of the 20th century saw the rediscovery of the use of special terroir in order to improve quality and value, which has led to a more nuanced view of Moselle wine that, a few years before, had been characterised by overproduction, label scandals and cheap offers. On 10 November 2006 in Burg, the Moselle Regional Initiative was founded. The introduction of the Moselle as an umbrella brand was based on that of the Eifel region and covers products and services from the areas of agriculture, forestry, tourism, handicrafts and nature. Moselle slate (Moselschiefer) is a manufacturing and trade description for slate from the municipalities of Mayen, Polch, Müllenbach, Trier and its surrounding area. Today only products from the roofing slate mines of Katzenberg in Mayen and Margareta in Polch bear the name Moselle Slate. The name is derived from the historical transport route for this slate along the Moselle to the Lower Rhine. The Moselle was celebrated in Mosella, a Latin poem by Ausonius (4th century). In the 20th century, the river and the folklore and local history of the towns along its banks were described by British travel writer Roger Pilkington. In the tale, "The Seven Swabians" of the Brothers Grimm, the eponymous Swabians drown trying to cross the Moselle. Château de Meinsberg (dit de Malbrouck): near Manderen, this castle was built in the 15th century but rebuilt in the 1990s. Today it is used for numerous cultural events. Château Fort de Sierck-les-Bains: situated just on the French-German border at Sierck-les-Bains, this fortress of the Duke of Lorraine dates back to the 11th century. Most of today's castle was constructed in the 18th century, following plans from Vauban. Schloss Berg: a Renaissance castle at Nennig, today a hotel and a casino. Alte Burg: a manor house built in 1360 at Longuich. One of the few surviving manor houses in rural Rhineland-Palatinate. Schloss Lieser: a palace at Lieser built from 1884 to 1887 in historistic style. Landshut Castle: a castle built by the Electorate of Trier in the 13th century at Bernkastel-Kues. Grevenburg: ruins of a castle at Traben-Trarbach built by Johann III of Sponheim-Starkenburg about 1350, destroyed, after many sieges, in 1734. Marienburg: a 12th-century castle and later monastery near Pünderich and Alf. Arras Castle: a 12th-century castle in Alf. Metternich Castle: a castle built around 1120 at Beilstein, today partly in ruins. Cochem Castle: The castle in Cochem was originally built in the 11th century, but was completely destroyed by French soldiers in 1689. The present castle was rebuilt later in the 19th century. Thurant Castle: Above the town of Alken is Thurant Castle, built in the 13th century. It is the only twin-towered castle along the Moselle. The fortress was built by the Count Palatine Henry of the house of Guelph between 1198 and 1206. From 1246 to 1248, it was the two archbishops of Cologne and Trier. Following conquest, it was divided by a partition wall into two halves, each with a keep (tower). During the 19th century, Thurant disintegrated, becoming a ruin; and in 1911 was acquired by Privy Councilor, Dr. Robert Allmers, who had it rebuilt. Since 1973, the castle has been owned by the Allmers and Wulf families. Ehrenburg: a 12th-century castle built by the Electorate of Trier at Brodenbach. Eltz Castle: The von Eltz family castle, whose history dates back to the 12th century. It remains in private hands to this day but it is open to visitors. Lower and Upper Castle, Kobern-Gondorf: two 11th-century castles, today mostly in ruins. Pyrmont Castle: This 13th-century castle near Roes was remodelled and extended several times during the Baroque era. Bischofstein Castle: Across the river from the municipality of Burgen is this 13th-century castle, which was destroyed during the Nine Years' War, but was reconstructed and now serves as a retreat centre for the Fichte Gymnasium in Krefeld. Wikimedia Commons has media related to Moselle River. 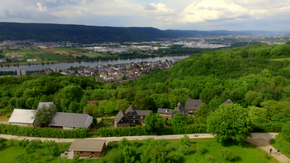 ^ a b Moselle: Holidays in one of Germany's most beautiful river valleys at www.romantic-germany.info. Retrieved 23 Jan 2016. ^ Sandre. "Fiche cours d'eau - La Moselle (A---0060)". ^ The Meuse, with a volumetric discharge of 350 m3/s (12,000 cu ft/s) is not considered, since it has not officially been a tributary of the Rhine since 1970 (although it is hydrologically). ^ Levainville Jacques, La canalisation de la Moselle[permanent dead link]. In: Annales de Géographie. 1928, t. 37, no. 206. pp. 180–184. ^ "Rivière Moselle – Dictionnaire des canaux et rivières de France". Retrieved 3 May 2016. ^ Institut National de l’Audiovisuel – Ina.fr. "La canalisation de la Moselle". Ina.fr. Retrieved 3 May 2016. ^ a b "Elwis database" (PDF). Archived from the original (PDF) on 2010-10-28. Retrieved 2010-03-17. ^ "DTNE : Direction territoriale Nord-Est VNF". Retrieved 3 May 2016. ^ Stuart Pigott, Chandra Kurt, Manfred Lüer: Stuart Pigotts Weinreisen – Mosel. Scherz, Frankfurt am Main, 2009, ISBN 978-3-502-15173-9, pp. 103 ff. ^ Publications by the Statistical Office of Rhineland-Palatinate. ^ "Burg Thurant – Wenn Sie etwas Besonderes suchen". thurant.de. Karl-Josef Gilles: Das Moseltal zwischen Koblenz und Trier 1920 bis 1950 (series of archive photographs), Sutton, Erfurt, 2006, ISBN 978-3-89702-943-9. Groben, Josef: Mosella. Historisch-kulturelle Monographie, Trier, 2011, 311 pp., 237 photographs. Joachim Gruber: Decimus Magnus Ausonius, "Mosella" Kritische Ausgabe, Übersetzung, Kommentar. Walter de Gruyter, Berlin. Series: Texts and commentaries, Vol. 42, 2013, XI, 370 pp. Rhineland-Palatinate is a state of Germany. Trier, formerly known in English as Treves and Triers, is a city in Germany on the banks of the Moselle. Trier lies in a valley between low vine-covered hills of red sandstone in the west of the state of Rhineland-Palatinate, near the border with Luxembourg and within the important Moselle wine region. The German philosopher and one of the founders of Marxism, Karl Marx was born in the city in 1818. Koblenz, spelled Coblenz before 1926, is a German city situated on both banks of the Rhine where it is joined by the Moselle. Mosel is one of 13 German wine regions (Weinbaugebiete) for quality wines , and takes its name from the Mosel River. Before 1 August 2007 the region was called Mosel-Saar-Ruwer, but changed to a name that was considered more consumer-friendly. The wine region is Germany's third largest in terms of production but some consider it the leading region in terms of international prestige. The region covers the valleys of the rivers Mosel, Saar, and Ruwer from near the mouth of the Mosel at Koblenz and upstream to the vicinity of Trier in the federal state of Rhineland-Palatinate. The area is known for the steep slopes of the region's vineyards overlooking the river. At 65° degrees incline, the steepest recorded vineyard in the world is the Calmont vineyard located on the Mosel and belonging to the village of Bremm, and therefore referred to as Bremmer Calmont. The Mosel is mainly famous for its wines made from the Riesling grape, but Elbling and Müller-Thurgau also contribute to the production, among others. In the past two decades red wine production, especially from the Spätburgunder, has increased in the Mosel and throughout the German vignoble and has become of increasing interest to the international wine community. 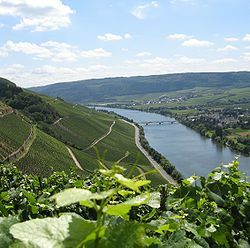 Because of the northerly location of the Mosel, the Riesling wines are often light, tending to lower alcohol, crisp and high in acidity, and often exhibit "flowery" rather than or in addition to "fruity" aromas. Its most common vineyard soil is derived in the main from various kinds of slate deposits, which tend to give the wines a transparent, mineralic aspect, that often exhibit great depth of flavor. In the current era of climate change much work has been done to improve and gain acceptance for completely dry ("Trocken") Rieslings in this region, so that most of the more famous makers have found acceptance for such wines, particularly in Europe. 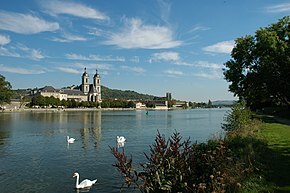 The Saar is a river in northeastern France and western Germany, and a right tributary of the Moselle. It rises in the Vosges mountains on the border of Alsace and Lorraine and flows northwards into the Moselle near Trier. It has two headstreams, that both start near Mont Donon, the highest peak of the northern Vosges. After 246 kilometres (153 mi) the Saar flows into the Moselle at Konz (Rhineland-Palatinate) between Trier and the Luxembourg border. It has a catchment area of 7,431 square kilometres (2,869 sq mi). The Kyll, noted by the Roman poet Ausonius as Celbis, is a 128 km long river in western Germany, left tributary of the Moselle. It rises in the Eifel mountains, near the border with Belgium and flows generally south through the towns Stadtkyll, Gerolstein, Kyllburg and east of Bitburg. It flows into the Moselle in Ehrang, a suburb of Trier. Zell (Mosel) is a town in the Cochem-Zell district in Rhineland-Palatinate, Germany. Zell has roughly 4,300 inhabitants and is the seat of the like-named Verbandsgemeinde. Between Bingen and Bonn, Germany, the river Rhine flows as the Middle Rhine through the Rhine Gorge, a formation created by erosion, which happened at about the same rate as an uplift in the region, leaving the river at about its original level, and the surrounding lands raised. This gorge is quite deep, about 130 metres (430 ft) from the top of the rocks down to the average water-line. Bischofstein Castle is a castle on the Moselle in Germany. The castle sits between Moselkern and Hatzenport and across from the borough of Burgen. It was a stronghold belonging to the Archbishops of Treves. A characteristic attribute of the castle are its tall cylindrical donjon tower girt round with a white plaster streak about halfway up and the ruined chapel adjoining it. Valwig is an Ortsgemeinde – a municipality belonging to a Verbandsgemeinde, a kind of collective municipality – in the Cochem-Zell district in Rhineland-Palatinate, Germany. It belongs to the Verbandsgemeinde of Cochem, whose seat is in the like-named town. Valwig is also a winegrowing centre. Nittel, on the Upper Moselle, is an Ortsgemeinde in the Landkreis [county] of Trier-Saarburg in the state of Rhineland-Palatinate. It belongs to the Verbandsgemeinde [United Municipalities] of Konz. The place, located between dolomite and limestone cliffs, is a nationally recognized resort. Trier Hauptbahnhof is a railway station for the city of Trier, in the German state of Rhineland-Palatinate. It is a through station, about 500 metres (550 yd) east of the inner city and the Porta Nigra. The Koblenz–Trier Railway is a railway line in the German state of Rhineland-Palatinate, located mostly on the left (northern) bank of the Moselle, connecting Koblenz via Bullay to Trier. It is known in German as the Moselstrecke, i.e. "Moselle line". It is often called the Moselbahn links der Mosel to distinguish it from the Moselle Railway (Moselbahn) or Moselle Valley Railway (Moseltalbahn), which ran on the right (southern) bank of the Moselle from Bullay to Trier, but was abandoned in the 1960s. The line was built as part of the Cannons Railway (Kanonenbahn) and opened in 1879. The Saarbrücken–Trier railway, known in German as the Saarstrecke in the German states of Rhineland-Palatinate and Saarland. It connects Saarbrücken and Trier. It was opened in 1858 and 1860 and is one of the oldest railways in Germany. The Lower Moselle is the name given to the lower reaches of the Moselle river - just under 100 kilometres long - in Germany between Pünderich and the Moselle's confluence with the Rhine at Koblenz. The Lower Moselle landscape differs from that of the Middle and Upper Moselle, much of it forming a narrower valley with high and steep sides in places. On the cut banks of the river that are oriented towards the south and west, vineyards are managed, often on the tiniest, terraced strips of land on steep hillslopes. The Calmont, also called the Calmond, between Bremm and Ediger-Eller in the county of Cochem-Zell in the German state of Rhineland-Palatinate, is a steep hill on the heights above the Moselle river to a height of 380.6 m above sea level (NHN). It lies within the Moselle wine region and is home to the vineyards of Bremmer Calmont and Ellerer Calmont which, with gradients of up to over 65º, are among the steepest vineyards in the world. Moselle Romance is an extinct Romance language that developed after the fall of the Roman Empire along the Moselle river in modern-day Germany, near the border with France. Despite heavy Germanic influence, it persisted in isolated pockets until the 11th century. The Moselle Eifel forms the southeastern strip of the East Eifel to the left of the Moselle from the city of Trier downstream as far as Moselkern; in the southeast it does not reach as far as the Moselle Valley. It lies exclusively within the German state of Rhineland-Palatinate and is a truncated highland, roughly half of which is forested. The ruins of Thurant Castle stand on a wide hill spur made from slate above the villages of Alken on the Moselle in Germany. The castle is located within the county of Mayen-Koblenz in the state of Rhineland-Palatinate) and belongs to the spur castle type. Next to the castle which stands on a steep shoulder of the valley are vine gardens on the sunny side.